Sorry it’s taking so long to finish this short series… but I’ve been baffled… trying to figure things out. These Polaroid photos of spirit faces are some of the most amazing and important phenomena of the past century, yet they seem to draw little interest. They clearly show the faces of invisibles—spirits—intimately enmeshed in our world, in close interaction with us carnal humans. They provide some of the best physical evidence to date of nonphysical existence!… evidence that blows away the spiritual blinders of materialistic science! !… but no one cares. * And that’s baffling. Hm, do people really not care… or could there be some other reason why the general reaction to the pictures is… well, dead silence? That’s what I’ve been ruminating about for more than a decade, especially over the past month… and particularly the past few days as I try to complete this series of articles. And I’ve come up with some possible reasons why the pictures are generally ignored. First of all, people who don’t know me and are unfamiliar with my work probably assume these photos are faked… photo-shopped. And that’s understandable. If I were to see these pictures for the first time, with no background knowledge of the research behind them, I’d probably assume it was all a hoax unless I could be convinced otherwise. After all, thousands of hoaxes can be found on the Internet. Why not this? So let’s zoom in a bit to consider people who are intrigued enough by the pictures to dig a little deeper. 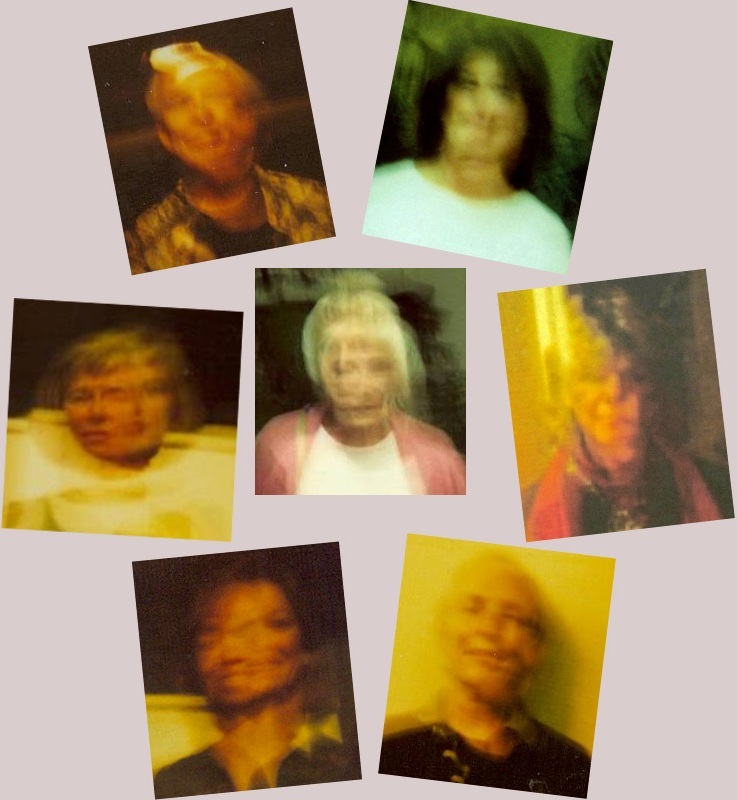 They study the vast, serious, and credible results of ITC on our www.worlditc.org website… and their gut feeling begins to tell them that these are genuine Polaroid photos that clearly seem to capture nonphysical human (spirit) faces showing up with physical human faces on film. I know there are many people like that out there. We’ve had hundreds of thousands of visitors to our website over the years… and it’s inevitable that visitors leave that site, after exploring it in some depth, with the realization that something unusual and something real is going on in ITC. I’m fairly confident that those people have a sense that there’s a legitimate basis for these spirit face photos, but even from them there’s a complete silence about the pictures. An acquaintance of mine, Dan Drasin—a bright, serious filmmaker from California—accompanied me to a workshop I hosted at the Wainwright House in New York, and he captured the event on film as I got some excellent results… including the picture at the far right in the above collage… the picture of a woman whose late son was present that night in spirit and showed up with his mom on film. Even Dan apparently hasn’t figured out how to reconcile the spirit faces. He’s worked on afterlife documentaries since my workshop, but the photos from that evening have not been included. For me, the spirit face phenomenon is an eye-popper, and it’s hard to understand why people who know it’s for real aren’t shouting it from the rooftops! Well, I’ve come up with several possible reasons for that. Or maybe what I’ve come up with is just several different ways of looking at one single reason… one important reason that rests at the core of our being. First, many of the pictures are indeed vague and blurry, and it’s easy for the skeptical mind to shrug them all off as the result of camera motion… to toss out the pearls (the pictures that clearly have distinct, different faces in them) with the oyster shells, as minds fettered by dogma (be it religious or scientific dogma, or any other form of rigid thinking) tend to do. Second is the boggle factor. We all have our own unique mental model of reality, forged by the information streaming into our five senses. We take the things we see and hear, and the things we learn from school and church and science and the media… and we patch it all together into an inner roadmap of the world. It’s a dynamic roadmap, but only to an extent. As new information streams into our mind everyday, we try to redraw the roadmap accordingly. But if certain new information is too radical… if the model would have to be broken and rebuilt to accommodate it, then the mind becomes boggled. The thought of breaking the model is scary, so our mind snaps shut. It rejects all of the new, threatening information, even if it’s accompanied by good, solid evidence… even indisputable proof! Third, the pictures are just plain spooky, and we humans shy away from spooky stuff… especially when it’s up close and personal, like these spirit face photos. I’m not sure if these are three different reasons why people might ignore strange phenomena like this, or if they’re three different situations relating to the same basic reason… fear. So I’m going to continue this series to explore the nature of our fear of the unknown, to see if I can uncover the source of that fear and ways to overcome it. This entry was posted in About Mark Macy, After we die, Heaven and Earth, Inner exploration, ITC, Other-worldly matters and tagged ghosts on film, skepticism, spirit faces. Bookmark the permalink. Hi. I first found your world ITC website many years ago when I started to hear an unexplained voice coming through my radio. I have always been able to see spirit but not hear them and the voice in the radio was a huge shock to me and quite scary. Over these past few years I have developed clairaudience, something I thought would never happen to me, as despite been able to see spirit, actually hearing them was always a fear. At first the spirit voices would sound almost digitalised and robotic, I would also hear sounds similar to what you’d expect to come from a computer, and my head would physically buzz and vibrate. I had to find a way to convince myself I wasn’t going insane so after discovering Evp recording was able to record what I hear, play it back to my partner, who then told me what he heard which would be the same. I was relieved to have confirmation, but at the same time couldn’t understand why my partner was not amazed and more interested in what I recorded. He doesn’t seam afraid by it and although he is supportive of my experiences and has witnessed loud knocks on doors and windows while sat with me he just has no interest. I fully believe in your photographs and think the work you have done with spirit is fantastic. It seams to me that spirit do want us to know they are around but whether people can bring themselves to acknowledge them is their choice. There are many reasons why people don’t want to accept life after life. Accepting the bigger picture can mean re-evaluating your life, actions and personal hang ups. That journey when spirit take you on it can be quite painful. There will be thousands of people passing through your website and all of them will take something special away with them whether they know it or not. Look at your website and work as a bridge of service to man. It has been invaluable to me on my journey and I’m sure many, many others too. Your research and evidence will always reach those it needs to, but maybe not always those who we’d like it to. Maybe the time for that is not right just yet. The fact you have taken the time and made the effort to make your experiences available to others is something I, and I’m sure, many people appreciate and learn from. It sounds to me that you’re one of those rare people with an innate aptitude for ITC, considering the physical and electronic phenomena that happen in your presence. Thanks very much for your good comments… which I agree with completely. You are welcome, and thanks for all the information you put out. Just think, if we were all open to experiencing the spirit energy around us, the life of man would change considerably. We wouldn’t get so hung up on trivial matters and likely our desires for the likes of money, power, etc would change. Maybe there is a reason powerful science institutes don’t show an interest in evidence from spirit. Maybe there is a reason that we are taught through movies and stories that spirits are evil and will harm you. Just think how different people would think about the next world and this if they were told the truth by those who have influence over the sleeping masses. I think slowly people are finding their way to the truth, and even if they don’t embrace the experiences they have or evidence they are presented with, it will have touched them and made them question, even if only for a moment. It’s Matt from the old Resonance Working Group. We emailed each other not too long ago. I’ve always been impressed with your Luminator work and of course believe it to be 100% genuine. Have you ever considered taking it a step down from the issue of spirits and trying to get people interested in the simple fact that the Luminator can cause gross distortions in Polaroid photography? You would not even have to mention the spiritual side of the phenomenon. Just say, “Hey, I’ve got a machine that regularly causes these effects. Can you explain how?” You might actually get someone interested and, more importantly, you might get photography experts, etc., to acknowledge that the distortions are real–which is a totally inexplicable phenomenon in its own right. Yet it’s a phenomenon that doesn’t threaten to overturn someone’s worldview in an instant (the boggle factor you mentioned). If you can get people to recognize that the Luminator can cause such distortions, then the next step could be to look at the content of the distortions. Thanks for your thoughts on the above! Excellent idea, Matt… and I wish I’d thought of it 6 or 7 years ago… while Polaroid was still making their film. Since Polaroid film went out of production, there’s no media on which to capture the distortions and spirit faces. Mark, it will only work on Polaroid film? That’s interesting. It sounds as though the spirit actually works on the developing film instead of the exact moment the picture is taken; otherwise, the effect should work in any medium. I’ll give that some thought… although my excitement over the process has lost some steam in recent years. You may be right about the spirits’ influence on the developing emulsion. That’s what seemed to happen with the Scole experiences. One more question: Have you been able to use the Luminator for anything else since then? It’s easier to reject out of fear than it is to accept with even BIGGER fear. 😉 Sad but true. I’ve been a follower of yours for many years as ITC has just baffled me. Though I sometimes think it’s scary, I’m drawn to it. I wonder how thin the veil is between the worlds and why can’t we just at will step across. I was suicidal some years ago and death was at my doorstep which is how I found you. In my research of the other side I found it extremely fascinating, but knew suicide would not get me to the side I wanted to be on. So I’ll wait until my time comes. I just wanted to tell you that and thank you for your work and please continue. Thanks for sharing your personal journey, HLJ. Not always easy to do… the sharing OR the journey. Some souls choose a harder ride than others do. Always best to ride it to the end and experience all there is to experience… trying to make good choices that give us firm footing and a clear view, as best we can achieve. Riding it out makes the next life brighter.